Imagine a world of creativity, imagination, fantasy; what would that world look like? A world where colour, texture, and design is freely used to create magic. No structure, no musts, nor shoulds, or demands, just your version of a desirable world. Would it be expressed on a canvas? Or would you rather capture those moments via a lens? Express it in words? Regardless of the medium, they are all artistic creations, and expression. This world intrigued me from a young age. I always wondered how it was possible to capture a moment through the eye of a lens, and in moments, that image would miraculously appear on a blank white piece of paper. Just pure magic, I thought. My creative world started as a toddler in what was then my playground; Hioni Photo Studio. My innovative father, Con, was my role model as a photographer, as was my creative mother, Dina, connecting me to a world of designing and sewing of wedding dresses and endless other creative delights. The studio, the darkrooms, the developing and printing rooms, along with the sewing and pattern cutting areas were places I breathed in my daily inspiration of beauty, creativity and imagination. Alongside my professional life, I continued to capture life’s magic through camera lenses, as I engaged in personal creative passions along my journey. More than 40 years and thousands of photos later, I was honoured to introduce my first limited edition photo collection named ‘She Found Her Wings and Flew’, exhibited at the Antipodean Palette last year at Steps Gallery. This year, I have been given the opportunity by the president of the Greek Australian Cultural League (GACL) Cathy Alexopoulos OAM, together with three other artists Aphroditi Karalis, Stavros Messinis and Vasy Petros, who have also exhibited in the past, to coordinate the 8th Annual Antipodean Palette art exhibition. The Antipodean Palette is an exhibition initiated by the GACL, a non-profit organisation founded in 1970. The league initiates and organises a number of successful annual events supporting the creative endeavours of Greek Australian writers and artists. The art exhibition offers an excellent platform for established and emerging artists to collectively exhibit their work. Just as diverse as the artists, are their mediums, with artwork to be exhibited next month including painting, photography, mixed media, 3D installation, sculpture, heritage jewellery, monotype, and lithograph. The official opening will be launched by Michael van Vliet, chairperson of Multicultural Arts Victoria on Saturday 4 August at 3.30 pm. A life drawing workshop and poetry afternoon is also included as part of Antipodean Palette. 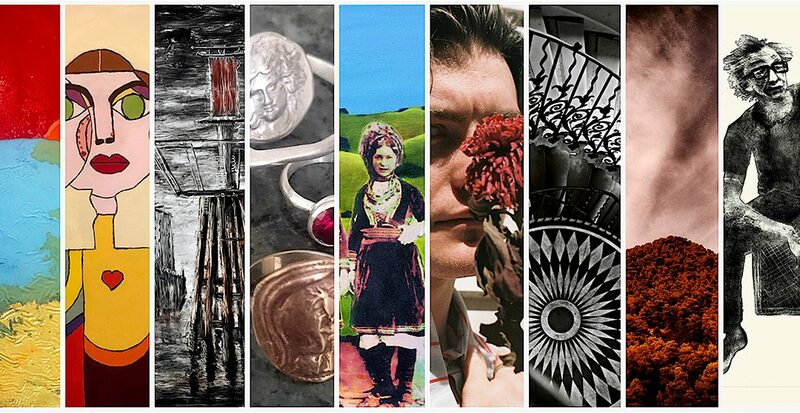 Come along and embrace the creativity, imagination and fantasy through the eyes of this year’s exhibiting artists. Antipodean Palette Art Exhibition will be on show at Steps Gallery (62 Lygon St, Carlton, VIC) from 3 – 9 August. Opening times: weekdays 11.00 am – 6.30 pm, weekends 11.00 am – 4.00 pm.